As the author of Love, Care and Share, An Inspirational Message, I’m available to speak about my experiences as an author, story teller, and son of an amazing, generous woman who taught me to become a more giving, generous soul. Please read more about Love, Care and Share, throughout this website and suggest any specific perspectives on which you would like to interview me. Want to meet this incredible author who landed a movie deal for his book? Click on the image or here to read the amazing story about the book and the movie deal. “It’s never too late to finish something you started,” author Tom Herstad swears. He’s visiting NYC from Toronto. 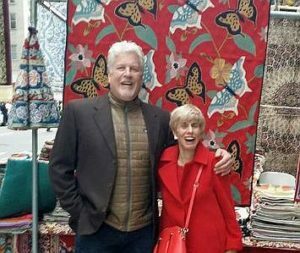 Tom owns a business, Regal Lighting Designs in Toronto, and we’ve been friends since he attended the National Publicity Summit in New York, years ago, as a new author, bringing his newly finished book, Love, Care and Share. I’ve been a guest speaker at the Summit for years and love interviewing the new authors. I liked this enterprising Ontarian and cheerfully followed his progress with the new book. Along the way, we became friends. I became Auntie Bonnie. And, it began to happen. 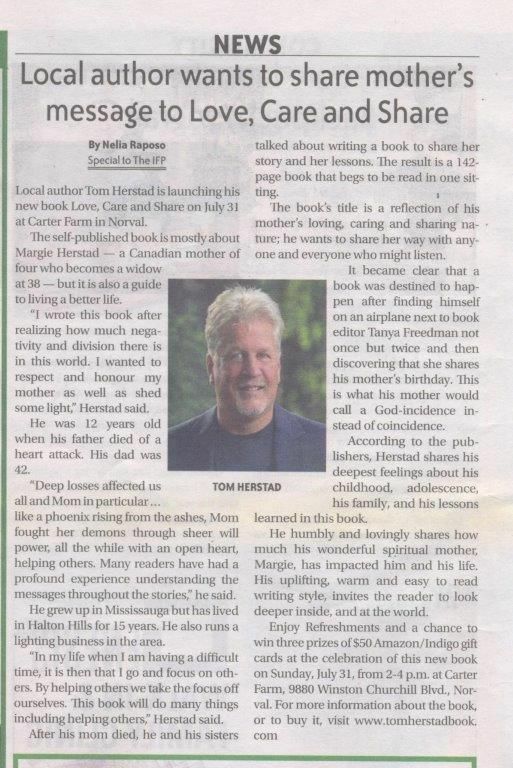 Love, Care and Share became an autobiography/biography memoir about his exceptional mother, Mary Margaret Herstad (Margie), who raised her four children in Ontario, amidst widowhood at 38. 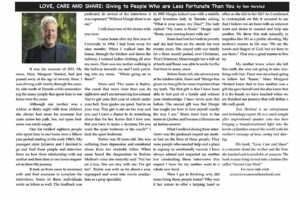 Love, Care and Share is the result of a series of interviews among 18 people, conducted by Tom and his sister Julie, whose lives changed as a result of spending time with the Herstad family. “It began by boarding the plane; I was seated next to a lady and her husband. We began to talk about her interior design business and my LED lighting design business in Toronto. ‘What else do you do, Tom,’ she asked me. I told her I was at the beginning of writing a book about my mother’s unique approach to life. Then Tanya Freeman told me that she was also a writing coach and independent publisher. Creative Hummingbird Results. When we landed, we went our separate ways. 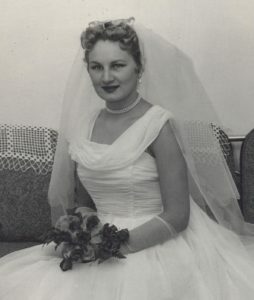 She agreed and they began a deeper conversation: why write about his mother Margie? “I took the spare bedroom. Later, Barbie was able to mature and moved on into the movie industry as a prop specialist. That was my mother, always helping, whenever asked. “When we landed, Tanya agreed to take the 68-page draft. Sixteen days later, she declared, “Tom, this is a unique story that must be told; I’m all in. Let’s go. Thwack.’ I took four months’ sabbatical from my lighting company and she coached me, with editing and format, and I published with Creative Hummingbird Results. What fun it was. “Bonnie, it took three years to find everybody, remembering Margie with them, and completing the book,” he said. “After I studied at the National Publicity Summit in New York City, met you and other speakers, I returned to Toronto, and the book promotion became established. “I was shocked when this reader came back to me, saying his family, who owns a company that finances books to movies, was eager to produce this as a movie. Bonnie, this six-foot-one person that I am, fell over,” Tom said, laughing. “I’m the student that attended the Rochester Institute of Technology in New York and never graduated, because I simply needed one English credit. In my hand, was the book I’d written, and now up to be made into a movie. When Tom’s son, Reigan, who has finished his second year at Humber, in film, and may work on this film about his grandmother to begin his career, came home. I, Bonnie, have had the pleasure of getting to know Tanya over the past months. She’s a best-selling Canadian author. Under her pen name, Gloria Silk, she’s also a USA Today best-selling author of romantic fiction. Very selective with her projects, she loved working with Tom’s inspirational book. She runs FullBookServices.com to help make authors’ dreams become published reality. So, what’s this Window Seat column all about? Tom leans back, sighs and counts. 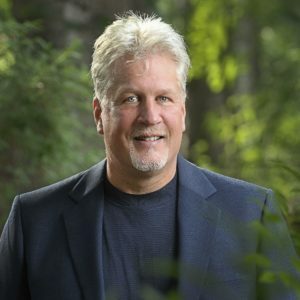 Please click here to connect with Tom Herstad with any questions or requests to speak at your organization or gathering. There are no coincidences – only God-incidents. Recognize and become the miracle. I invite your to watch the short book trailer in the sidebar. Please scroll down to see the latest article in the IFP and listen to the radio shows I have been interviewed on. There is also a high resolution photograph for your use. As an entrepreneur who has been in the LED lighting business for over fourteen years, I’d also be glad to speak about the spiritual and practical benefits of being good to ourselves, the environment and leaving our natural habitat in better shape as a legacy to our children and the next generations. Read my latest post here. Read: IFP News Article online. lba Alamillo, hypnotherapist talked self hypnosis & youth sports & Tom Herstad, “the LED lighting guy” discussing health & safety. Listen Now. If you would like to interview me, I would be delighted.